Soloist; Principal oboe the Philharmonia; professor of oboe at the Royal College of Music, London. Thank you very much for the oboe cane you sent me recently. I have now had a chance to try the cane more thoroughly and want to tell you how much I like it. I used to use French cane and when my last lot ran out last December I went through a rather desparate time as the next lot of cane they sent me was nowhere near the same quality. Your cane seems to be really virbrant and of a very even quality, therefor my success rate is now much higher. Thanks again for all your help -I'm extremely grateful to you for your great service! Christopher Cowie is the principal oboe of both the Philharmonia Orchestra and the Academy of St Martin-in-the-fields chamber orchestra. He was born in Cardiff and studied the oboe at the Royal College of Music with Michael Winfield, where he was awarded an Exhibition and the senior oboe prize and later with Maurice Bourgue in Paris. During this time Christopher performed as Principal Oboe with the European Community Youth Orchestra. 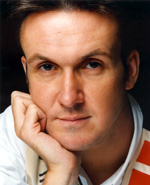 Before joining the Philharmonia in 1999, Christopher previously held the Principal Oboe positions in several UK orchestras, including the Royal Philharmonic Orchestra and the Orchestra of the Royal Opera House, Covent Garden. Christopher has also been invited to perform as guest Principal Oboe, with some of the finest orchestras in Europe, such as The Chamber Orchestra of Europe, The NDR Orchestra in Hamburg and the Bayerischer Rundfunk in Munich. As a soloist, Christopher has performed at all the major venues in London and around the UK, under conductors such as Sir Charles Mackerras, Neeme Jervi, Sir Neville Marriner, Gennady Rozhdestvensky, Andras Schiff and Daniele Gatti. Solo recordings include The Mozart Concerto and Sinfonia Concertante under Sir Neville Marriner with The Orquestra de Cadaques in Spain and a second recording of The Sinfonia Concertante with The Royal Philharmonic Orchestra. When not performing, Christopher enjoys teaching and is professor of oboe at the Royal College of Music in London.